Thanks so much for the advice regarding my mother in law and her residential care. It’s not often that a professional will spend the time you did assessing her situation and then be honest enough to advise there was no value you could add in her particular situation. The family is comforted to now be sure they are in the best possible position financially. It was a very stressful 6mths for us but with the help of Shane ensuring us that our mother would be well looked after in the time she has with us was so comforting and so true, as the work is finalized now our mother is in good hands and well looked after. I would highly recommend you to my friends who would be in this situation one day. I have expressed how you do your work thoroughly and you have been in this business for many years and you know what you are talking about. From the start, it became very clear that Shane had an in-depth knowledge of age care fee structures, and also a clear understanding of how stressful it is for relatives to make the right financial decision for their loved ones. We found Shane to be friendly, courteous and above all, very professional in the advice he gave us. We would not hesitate to recommend him to anyone seeking ethical and non-biased financial advice. With time pressure on us, with so much still to do, a fateful day occurred. On this very busy, but very fulfilling day, we acquired Power of Attorney, engaged Shane and his Financial Group who immediately took over our affairs. Shane should be thanked very much for all the hard work he did in such a short time. A relief of great magnitude to us all. Having to place my husband suddenly into residential care was extremely emotional and stressful, but the financial implications were totally confusing. Shane’s calm management of the situation, his explanation of the refundable accommodation deposit and the daily accommodation payment, completion of necessary Centrelink forms and advice on future financial management were invaluable. From the first phone call I had with Shane I felt confident that I was in good hands. It is a highly emotive, stressful, confusing and complex issue for most people to deal with and as an only child with an ill mother I was under enormous time and financial constraints. Shane was always professional, calm, reassuring and confident he could structure and negotiate a great outcome for my mother which he did. Shane, I must say your gentle caring phone manner is so relaxing to the listener. You obviously have compassion when supporting families to make vital decisions to the welfare of their elderly. You absolutely helped us in placing my parents into care and handled all the paperwork and procedures that we would not have been able to do from this distance. I would highly recommend your services. Of all the stress’s of relocating mum into a nursing home the financial side wasn’t one of them. Shane is experienced, decisive, intelligent and has a personal warmth. Not only did we a clear way forward we also got tax breaks and income we didn’t know mum was entitled to. Recently my family needed to secure residential care for a sick relative. Shane was exemplary in his advice and support during this time. He ensured that our finances were taken care of and we could not be happier with the result. My aunt moved into Residential Care very suddenly and, honestly, without the advice and assistance from Core Value I would have been totally lost. 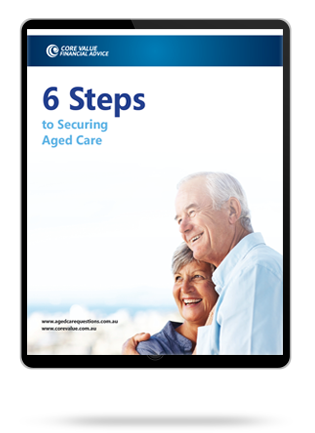 They provided options regarding aged care and advise in relation to steps forward to negotiate the aged care process. I couldn’t have done it without them. Nothing was ever a problem and I was treated with respect, something I really appreciated. I just wanted to convey my thanks and sincere appreciation for the support and advice you provide to the potential residents at Merrimac Park Private Care. Many of the families I see are quite confused by all the options available in Aged Care and are really unsure what the best options is for them especially when it comes to investment planning and strategies. Every person that has met you cannot speak more highly of your service, knowledge and commitment to finding the right solution. I would like to take this opportunity to thank you for your professional advice and support provided to my father. Your financial services made his decision to move into aged care less stressful and positive from a financial point of view. By assisting us with negotiating the amount of bond, providing strategies to reduce the income test fee, determining Dad will have enough funds available to pay for aged care costs and projecting his savings will not run out, you have given him peace of mind and saved Dad from making many unwise decisions which could have cost him lots of money. We can now go and enjoy life knowing that this move was the right decision financially, a move that also meets his changing living needs. My 86 year old uncle, who was the sole carer of my aunty, had a stroke and as a result I was appointed their administrator for all financial matters. As part of the (Queensland Civil Administration Tribunal) QCAT decision I was required to obtain expert financial advice to manage their affairs. Core Value Financial Services were recommended to me and I engaged their services to provide a financial management plan. I have nothing but praise for the professionalism displayed. The numerous emails, phone calls and questions I had were answered promptly and in a language a lay person like me could understand. Core Value had a very detailed knowledge on all aspects of aged care and Centrelink rules and regulations and more importantly had an understanding of my uncle and auntie’s circumstances and the extended family’s requirements for their continued wellbeing and financial management. Although the initial appointment of Core Value Services was completed I have extended their services to assist in providing further advice regarding ongoing aged care fees and reporting requirements to Centrelink and QCAT. I would have no hesitation in recommending Core Financial Services to anyone requiring expert financial advice.